A Fudo with Yellow Eyes. 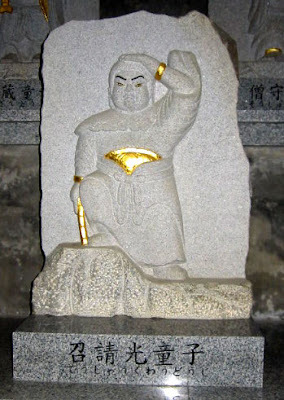 This statue at the temple Eikyu-Ji (Eikyuuji) 永久寺 in Tokyo, near Minowa station. It was founded in 860 by Priest Ennin. 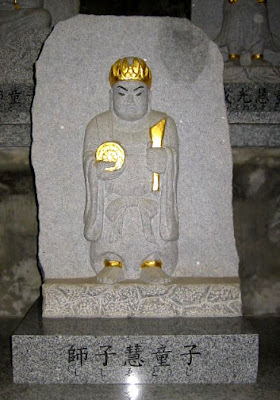 The Fudo statue was carved by Jikaku Daishi Ennin 慈覚大師円仁 and is similar to the Meguro Fudo. It is said that the mice ran away in horror of this statue, hence its name. dooji　童子 Doji, child attendants of Fudo Myo-O. Each of the temples is dedicated to one of these attendants. See each temple for a picture of the attendant doji. 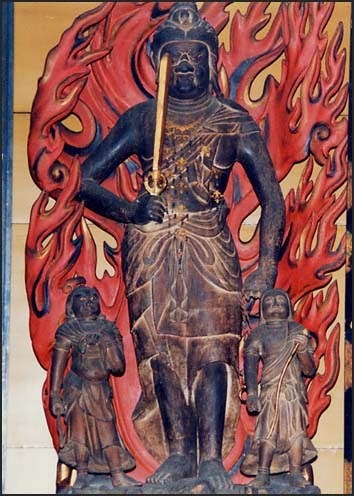 In the right hand he holds a sansageki 三叉戟 three-pronged spear. 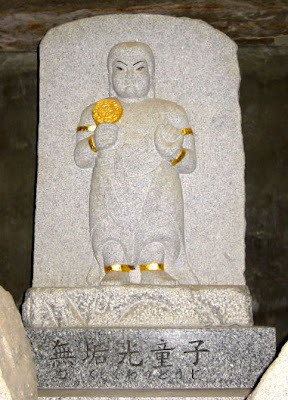 In the left hand he holds a rinpoo, rinpō 輪宝 wheel of law. 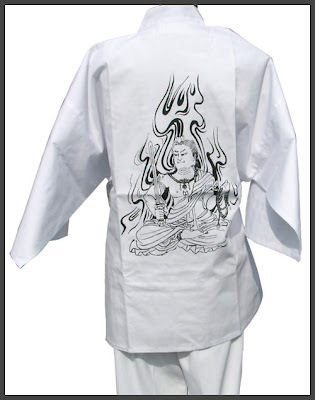 Shojo Biku refers to a monk in training. He is an incarnation of Monju Bostsu. a box for sutra script written on palm leaves 梵篋 /宝篋 (bonkyoo) in his right. bonkyou　梵篋 A box for sutras. Indian sutras were written on long, narrow palm leaves. The leaves were stacked one top of the other, with boards placed in between each leaf. The boards and leaves were then tied together to create a box-like form. A few Indian palm-leaf manuscripts date as early as the 9c. 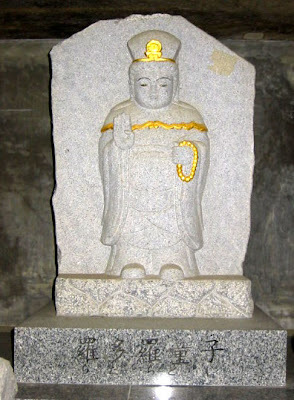 As a *jimotsu 持物 (hand-held attribute for Buddhist images), the bonkyou may be held by *Senju Kannon 千手観音 (Thousand-armed Kannon) and the bodhisattva *Monju 文殊. 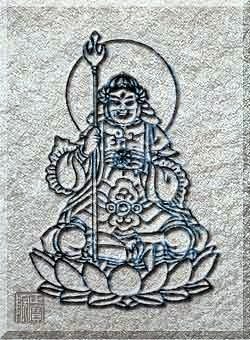 In the 13c painting of Monju from Enryakuji 延暦寺 in Shiga prefecture, a bonkyou is balanced on the lotus flower in his left hand. A similar form is the *houkyou 宝篋 hookyoo, which may be used interchangeably with bonkyou but this term implies a box for rolled sutras as opposed to the box for flat sutra pages on leaves. A box for sutras was sometimes carried on the back of a yamabushi 山伏 or mountain priest in the ascetic practice of shugendou 修験道 (see *En no gyouja 役行者). This type of box is also called a bonkyou. Temple Nr. 01 . Oyamadera (Ooyamadera) . The main halls are in a deep forest and an Inner Sanctuary still further up the steep mountain. The main statue is a Kannon with 1000 Arms. 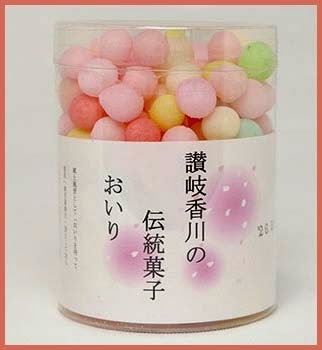 On the first Sunday in January the annual festival of "Strong men and Power Rice Cakes", chikara mochi 力餅 is celebrated. People have to carry the heavy rice cakes, which have been dedicated to Kannon during the New Year celebrations, in the temple garden and the one who can carry it the longest wins. Men carry 169 kg, women 50 kg, first graders 45 kilo and small children 10 kg. This festival is in memory of Lord Shichijoo Kanenaka 七条兼仲（しちじょうかねなか), a strong warlord in the times of Minamoto no Yoshitsune ［1159～1189］. 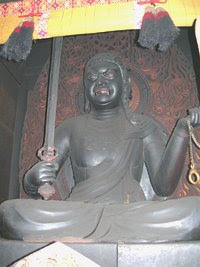 This Fudo is also one of the "Wave-cutting", Namikiri Fudo. 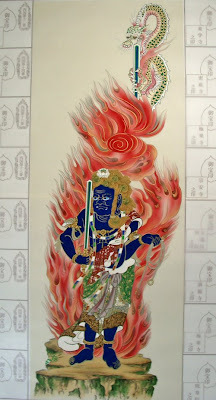 CLICK for more photos of Kongara Doji ! At this temple, the powerful Kankiten is also venerated. This elephant deity (Ganesh in India) is rather wild and it took a Kannon with its 1000 arms to appease it. This temple is between Nr. 5 and Nr. 6 of the Shikoku Pilgrimage to 88 Temples. It is the first of the "Extra temples". * Yashima is in the east of Takamatsu, which is one of the best-known ancient battlefields between the Heike and the Genji clans. * The name Yashima means literally 'roof island'. Yashima, so called because of its shape like the roof of a traditional Japanese farm house, is a mesa headland jutting out into the Seto Inland Sea. But at the time when the Genpei War was fought, it was, as is implied by the name, an island separated from the mainland by the Aibikigawa River. * However in February 1185, the forces led by Yoshitsune outwitted them and instead of attacking them directly from the sea, crossed the sea to Awa (now Tokushima Prefecture)in no longer than six hours helped by a favorable wind. They marched all the way to Yashima by land overnight, which would have normally taken two days. * The attack at the court from behind was so unexpected that the Heike battle boats rushed off the coast in a panic. 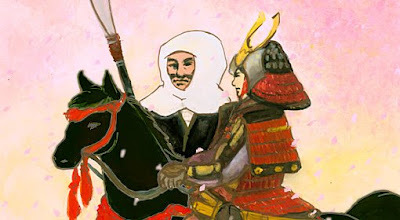 The battle was fought not on the sea but on the coast, creating thousands of episodes including the death of Sato Tsugunobu sacrificing himself for Yoshitsune, Nasuno Yoichi's skillful shot at the fan, Yoshitsune's drop of his bow in the water and many others. Thus Yashima became one of the most colorful stages of the historic feud, leaving countless episodes. * Yashima retains many names related to the historic battle. According to the stories, the main battlefield was the whole Dannoura area, where now stands Yashima-higashi Primary School. Visitors now find the old court site of Emperor Antoku, Tombs of Sato Tsugunobu and Kikuomaru, Rock on which Nasu　no Yoichi prayed for success of his feat, Rock on which the bestriding Yoichi shot his arrow at the fan. 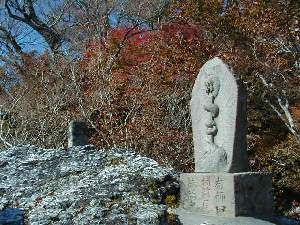 The place names of Genjigamine Peak, Funakakushi, Chinoike Pond and others are reminiscent of the past. 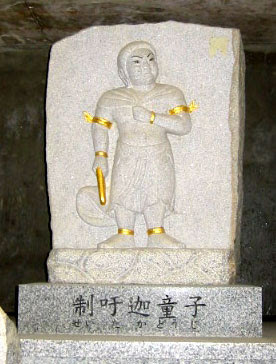 The main statue is a Kannon with 11 heads. 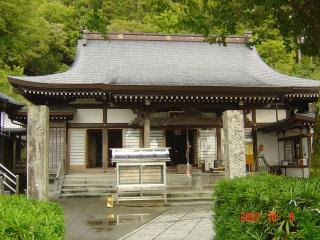 This temple is also the "Mountain Sanctuary" of Kakurin-Ji 鶴林寺. Kobo Daishi practised austerities here when he was 19 years old. He had a dream and found a cave nearby. To rid the cave of evil spirits he performed a fire ritual and banned the evil dragon into the walls of the cave. You can visit this cave, which is about 100 meters long, with a guide from the temple. CLICK for more photos of Seitaka Doji ! This temple is also Nr. 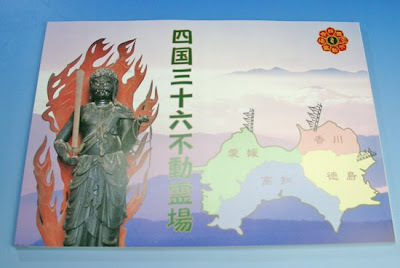 3 on the special temples of the pilgrimage to 88 temples in Shikoku. The temple is situated on Mt. Hashikura 箸蔵山, and you can get up there via Ropeway. This temple is located on a hill above the town of Ikeda. The temple also has a youth hostel to stay. I could not find more about this legend, but below are two more items. Kokawa-dera: 3rd temple on the Saigoku Kannon pilgrimage in Western Japan. 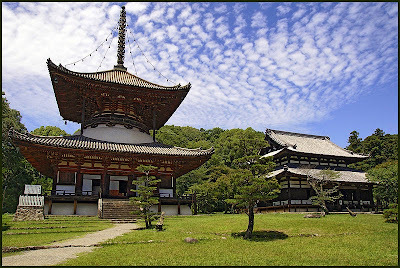 Temple Negoro-ji and Kokawa-dera were powerful in the Kishu area, second only to the temples at Koyasan. There is also a Yakushi Nyorai digging with his nails, at the temple Dainichi-Ji. 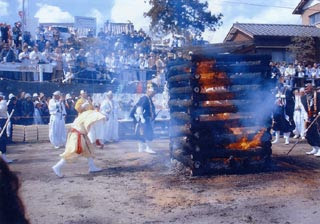 揉み錐.. momigiri, basically means "drilling into wood to make a fire". There was once saint Kakuban 覚鑁［1095～1143］, who practised at Koyasan at the temple Mitsugon-In 密厳院. He was not well liked by his fellow monks, because he was very strict and also tried to teach them about the Amida faith. 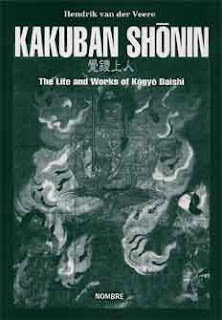 Kakuban founded Shingi Shingon sub-sect, and wrote an essay about "Amida hishaku", an esoteric interpretation of the Pure Land teachings. He promoted an esoteric interpretation of teachings of the Pure Land. He believed that the central buddha of Shingon devotion, Vairocana Buddha, and Amida Buddha were one and the same and that their pure lands were also one and the same. The monks of temple Kongobu-Ji wanted to kill him and entered his temple. 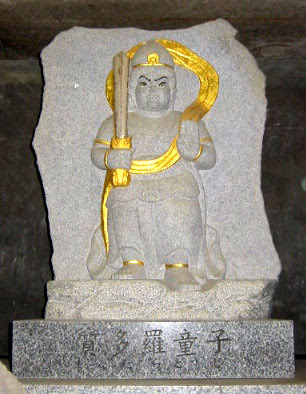 When they came to the Fudo Hall, there were two identical statues of Fudo. 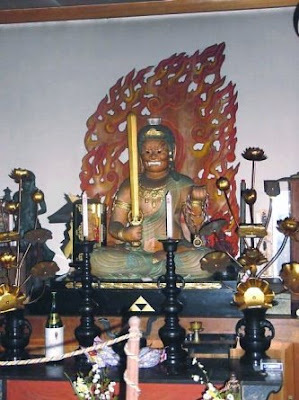 One was the monk Kakuban hidden as this figure, and one was the Fudo statue itself. The monks shot two arrows in the knee of each statue, piercing the leg of each and saw red warm blood ran from both of them. The murderers became afraid and ran away. and spent the rest of his life at the temple Negoro-Ji. According to the Genko-shakusho, one day when Kakuban was eight years old, a messenger of the provincial governor came to see his father to press him for payment of taxes. The messenger's attitude was rude, and the boy's father was hiding behind the screen. The boy was shocked and asked the monk who was staying at his house, "Who was that messenger?" and "Who is the highest authority in Japan?" After learning that the emperor was the highest person, he further asked the monk if there was someone superior to the emperor. The monk replied that the Buddha was the supreme authority. This incident prompted him to decide to become a Buddhist; whereupon he himself burned incense as an offering to the Buddha. His father died when Kakuban was ten, and in 1107, at the age of 13, he went to Kyoto and became a disciple of Kanjo, the founder of the Joju-in Hall and a well-known esoteric adept. In the following year, he went to Nara to study the Kusha and Hosso teachings under Keigyo at the Kofukuji. 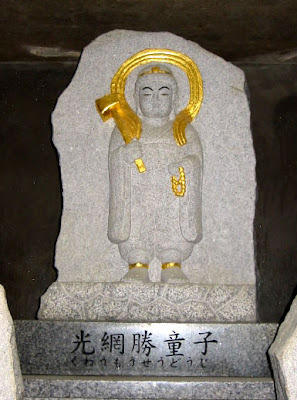 In 1110 he returned to the Joju-in and received the ordination of a novice from Kanjo and was given the name Shogaku-bo Kakuban - "Enlightened VAM" (VAM is the mystic syllable of Mahavairocana in the Vajra-realm Mandala). After the ordination, Kanjo sent him to Nara again - this time to the Todaiji to learn the Sanron and Kegon Teachings. While studying in Nara, Kakuban had a dream in which a Shinto god urged him to go up to Mt. Koya. So he once again returned to the Ninnaji and began the preparatory practice for becoming an acarya. In 1114, at the age of 20 Kakuban received the full ordination of a monk at the Todaiji, Nara, and then went up Mt. 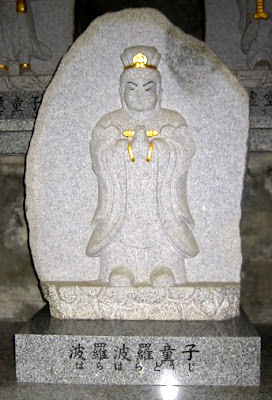 Koya, where he was greeted by a Nembutsu sage, Shoren of the Ojo-in. Being a devout aspirant to Amida's Pure Land, Shoren undoubtedly had a great influence on Kakuban. 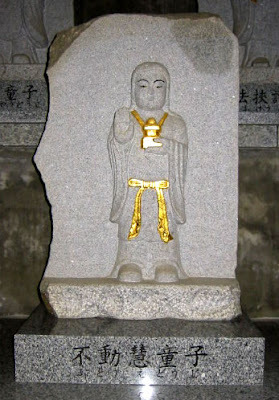 Kakuban learned many ritual practices under Meijaku, who was also known as an aspirant to the Pure Land through the Shingon Nembutsu. 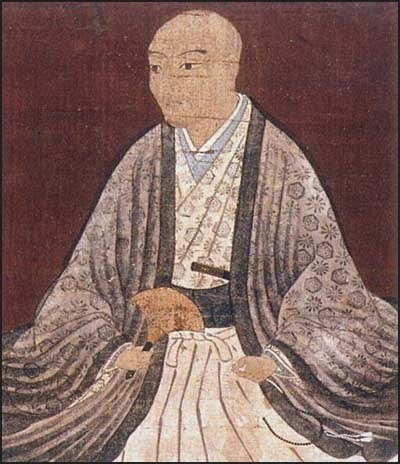 Under Meijaku's guidance, Kakuban particularly practiced the ritual called "Kokuzo gumonjiho," dedicated to Kokuzo (Akashagarbha) Bodhisattva. During his stay on Mt. Koya, until he was 27 of age, he also received the Dharma-transmission abhiseka (Denbo kanjo) as many as eight times. In 1121 Kakuban received from Kanjo of the Ninnaji the abhiseka of the two Mandalas, the Realm of Matrix-store and the Realm of Vajra. Later he tried again and again to master the Kokuzo gumonjiho ritual, until at the ninth attempt in 1123 he attained the transcendent state, and thus spiritual awakening dawned in his mind. In 1125 Kakuban is said to have written the Koyoshu, 3 fascicles, explaining the way of birth in Amida's Land, and sent it to his mother. In the following year, he wished to build a hall on Mt. Koya to revive the lecture-meeting of transmission of the Dharma, called "Denbo-e", which was originated by Kukai for the promotion of studies in esoteric Buddhism. 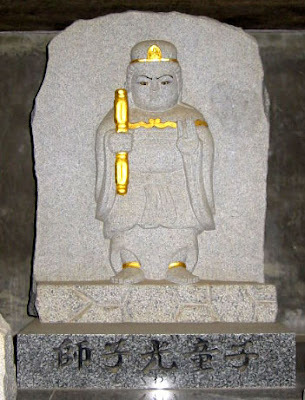 Coincidentally, a large estate in Wakayama was donated to him, so he invoked Shinto gods and built there a shrine to guard the Denbo-in which was to be built on Mt. Koya. Later the Negoroji was built on this site. In 1130 Kakuban received the patronage of the Ex-emperor Toba and his sanction to build the Denbo-in on Mt. Koya. Since that temple proved to be too small, in 1131 he built the Daidenbo-in temple (Great Denbo-in). 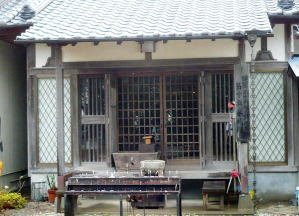 Thus he succeeded in establishing a center for the study and practice of Shingon. 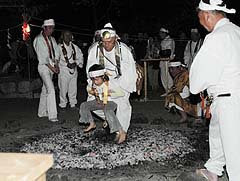 Kakuban's next effort was to rehabilitate the Shingon rituals. At that time, there were two traditions of rituals in the Tomitsu (the esoteric Buddhism of Shingon as opposed to that of Tendai): the Ono and Hirosawa schools, each divided into sub-schools. Besides those, on Mt. Koya another school, called "Chuin," was founded by Meizan (1021-1106). Kakuban sought to unify them all by establishing the Denbo-in school. In 1134, an imperial decree was issued to designate the Daidenbo-in and the Mitsugon-in, the latter constructed as Kakuban's residence, as temples for offering up prayers for the emperor, and Kakuban was nominated as the first zasu of the Daidenbo-in. Monks of the Kongobuji, the head temple of Mt. 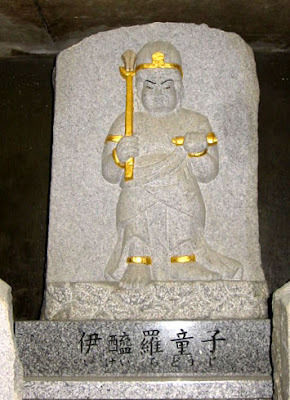 Koya, became angry and tried to expel Kakuban, but an Ex-emperor's decree ruled that those monks be punished. Later that year, Kakuban was additionally appointed zasu of the Kongobuji. 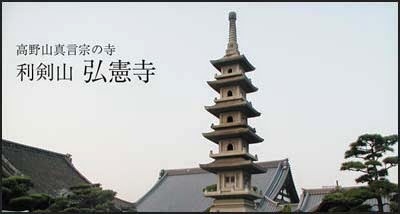 Until that time, the zasu of the Toji temple in Kyoto had also been the zasu of the Kongobuji, and so Mt. Koya had been effectively under the jurisdiction of Toji. Worried about further incurring the wrath of those monks who had already sought his expulsion, Kakuban finally resigned as zasu of both temples and retired to the Mitsugon-in. Nevertheless, the antipathy of the Kongobuji monks against Kakuban was aggravated. They even took to arms and attempted to kill him. Kakuban, however, remained in the Mitsugon-in and began a discipline of silence for a thousand days. In 1139, the armed monks destroyed the Denbo-in and its sub-temples, numbering more than eighty. Kakuban fled to Negoro in Wakayama, never to return to Mt. Koya again. He spent the rest of his life there teaching students and writing books. 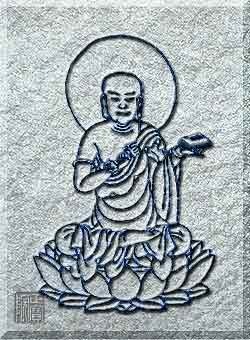 In 1143 when he was 49 years of age, he became ill, and later that year he passed away while sitting in the lotus posture, making the appropriate mudra, and facing towards Mahavairocana's Pure Land. 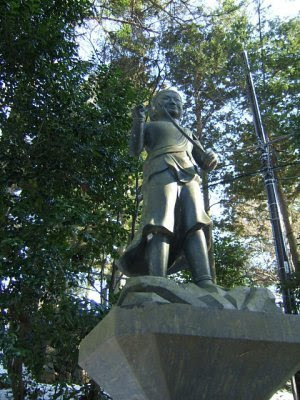 He was given the posthumous title Kogyo Daishi (the Master who Revived the Teaching) by Emperor Higashiyama in 1690. 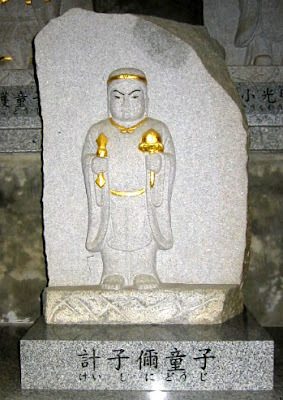 This is a sacred statue, who once protected Kakuban from his enemies. It is only shown to the public for one week in November, starting from Nov. 17. 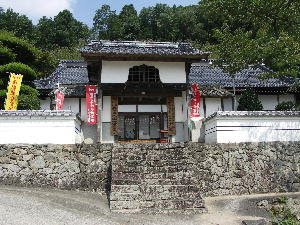 Negoro Temple is Nr. 34 on the Fudo Pilgrimage in the Kinki area. 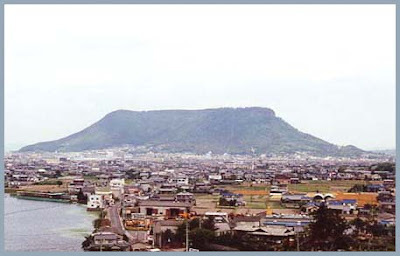 stands on the side of, and is surrounded by, the sacred peaks of the Katsuragi Mountains which dominate the horizon at the northern end of the city of Iwade, Wakayama in Japan. In 1087, a man named En no Gyōja established this area as a center for promoting Buddhism. Hōfuku-ji, as it was originally called, was built with the contributions of a devotee known as Hōfuku-Chōja who lived in the vicinity. In 1132, the Ex-Emperor Toba donated this temple, along with nearby manors, to the famous high priest Kōgyō Daishi; this new estate was called Ichijō-zan Daidenpon Negoro-ji. Kōgyō-Daishi, widely renowned as the restorer of the Shingon sect of Buddhism, moved here with his pupils, from Mount Kōya. After settling at Negoro-ji, Kōgyō-Daishi laid out his far-sighted plans and initiated the construction of the Enmyō-ji and Jingū-ji within the Negoro-ji temple grounds. Even after his death, in 1143, the Negoro-ji complex was influential and prosperous as the head seminary for Shingi sect of Shingon Buddhism for another 200 years or so. During the height of its influence in the late Muromachi period, about 2700 temples stood on the mountainside in the spacious grounds of Negoro-ji. In 1585 however, every building except the main pagoda, and a few others, were burnt down during the Siege of Negoro-ji by Toyotomi Hideyoshi, who feared the growing military power of the priesthood and the Negoro-gumi, warrior monks of the temple, who were skilled in the use of firearms. In 1623, the head of the Kii branch of the Tokugawa feudal clan, Tokugawa Yorinobu, initiated the reconstruction of the temple grounds, and through numerous re-buildings over many decades during the Edo period, the Negoro-ji was completely transformed.
. Saga Saga 佐賀県 Henro Pilgrims and Kirimomi . I could not find an explanation for this name yet. This temple was founded in 808 by Kukai Kobo Daishi himself. 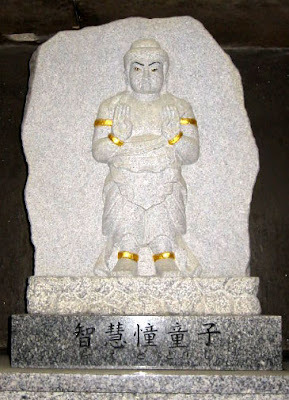 The statue in Main Hall is Fukuzo Bosatsu 虚空蔵菩薩. The temple was under the protection of the Hachisuka 蜂須賀 clan of Awa, when it also served as a relais station on the road 駅路寺, providing horses and food to the travellers. Is still very popular to this day. 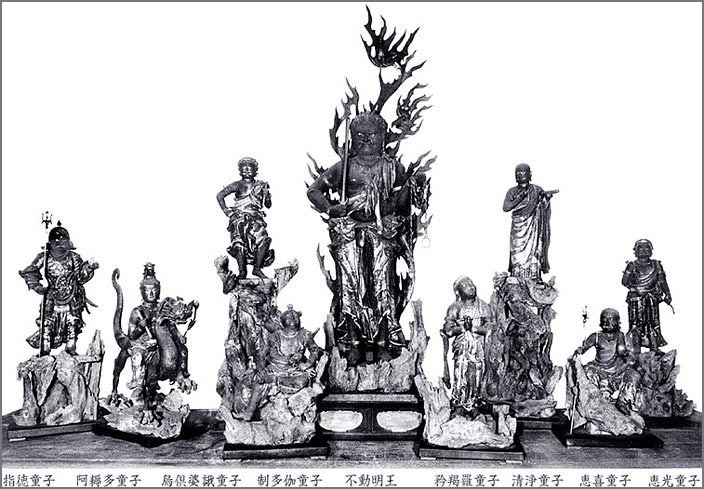 It has many statues of great value, most of them are now in the Nara National Museum. There is also an Inari Shrine in the compound where people pray for good business. Since the Fujiwara times, this Fudo is also known for its powers to prevent diseases, especially cancer, polyps and ulcers. This temple has been founded by Kukai Kobo Daishi more than 1200 years ago and is now known for its seasonal cherry blossoms and red leaves. 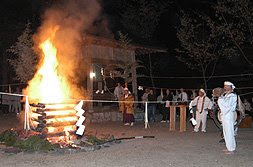 In march, a great Fudo Festival with fire rituals is held. 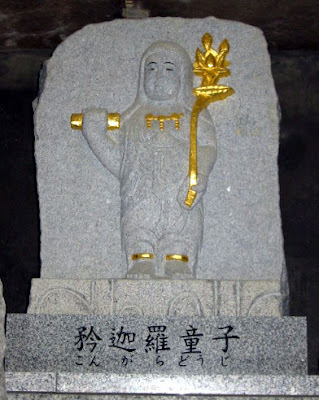 Bishamonten is also venerated at this temple, together with Fudo Myo-O. There is also a 脳天大神 at Yoshino. The temple is a simple structure, almost like a normal farmhouse of this area.